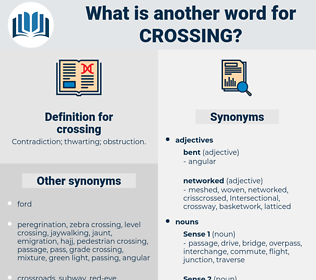 What is another word for crossing? intersections, headings, corridors, entrances, junctions, pedestrians, thoroughfares, sections, stretches, wordings, exits, changeovers, Hybridizations, portions, characteristics, Journeys, avenues, penetrations, accesses, Entries, preparations, accommodations, transfers, matings, visitors, LANES, passageways, combinations, conduits, appearances, inlets, passes, references, Tracks, changes, voyages, Vehicles, shifts, trips, kiosks, walkways, excerpts, aisles, PATHWAYS, quotations, extracts, Transients, supplies, headlights, beams, phrases, portals, bits, quotes, headlamps, texts, rounds, runs, paragraphs, crosses, tunnels. dipped-beam, switch, passageway, portion, beam, sailing, mating, voyage, switching, tunnel, breeding, transformation. Passed, come, Came, Arrived, Visited, Became, moved, Shifted, included, Went, stated, thought. 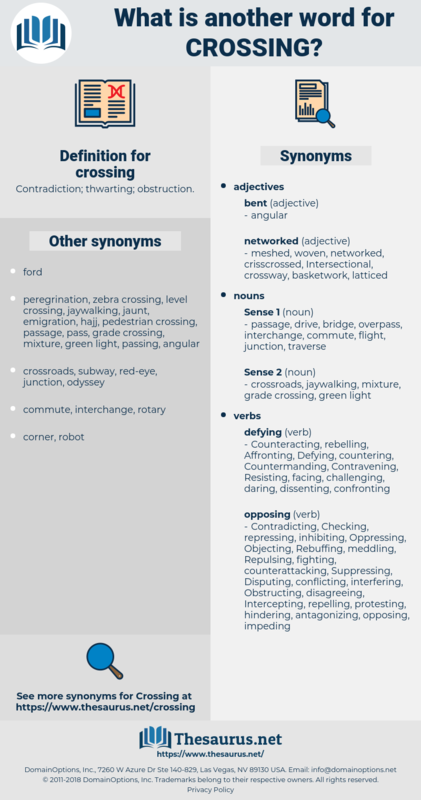 bypassing, Progressing, surpassing, Expressing, Overcoming, stopping, Incorporating, Converting, transitioning, Transcending, representing, existing, Transferring, interbreeding, Overshooting, resolving, confronting, overtaking, Transposing, proceeding, Removing, covering, Securing, Boycotting, Routing, penetrating, completing, incoming, customs, governing, Selecting, reflecting, reaching, overlapping, entering, suffering, Afflicting, commuting, fording, Negotiating, piercing, walking, flying, outpacing, coming, Bridging, Straddling, Migrating, arriving, neighbouring, serving, turning, increasing, operating, Undergoing, Translating, Producing, conveying, traveling, travelling, performing, riding, Experiencing, flowing, changing, Carrying, showing, saying, posting, enduring, Spanning, driving, spend, spending, affecting, Striding, becoming, joining, warning, Clicking, shifting, Checking, Via, vehicle, breaking, marking, signaling, Signalling, Extending, lying, Envisaged, sting, Achieving, rising, ranging, Attaining, trunking, reducing, Adopting, facing, ticking, hitting, heading, framing, signing, going, leaping, helping, running, steps, Stepping, happening, Diluting, leading, being, falling, meeting, putting, Having, 2006, cutting, taking, making, passing, switching, breeding. switches, passes, goes, reads, Narrows. Narrows, crosses, Cruces, passing, junction. transits, transitions, visits, FARES, crossroads. Narrows, crossroad, crosses, crossroads, cross-fertilization, passing, switchover, switch-over, move, bridge, junction. Every one wanted to turn to and help, even when crossing some field other than his own. There were but few people crossing. cryogenic, carousing, crossness, Circus Cyaneus, courageousness, carjacking, circumcise, cracking, car sickness, church mouse, churchgoing, church music, crushing, crookneck squash, coregonus, currajong, curiousness, crashing, croaking, coursing, caressing, creaking, crassness, circinus, craziness, crouching, corking, crookneck, coarseness, chrysemys, car racing, cryogenics.